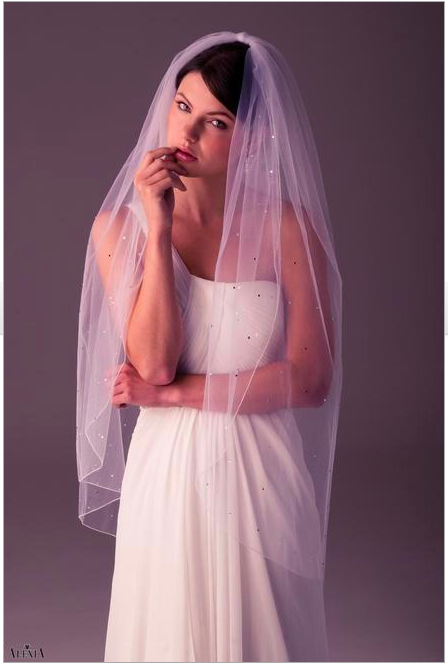 To veil or not to veil, this is the question? Mums & Nannas love a good veil & some brides just know without hesitation the answer to the veil question, others just aren’t sure at all. There is no right or wrong answer, as with all accessories it’s a personal choice for all brides to be. Are you kidding this day has been practiced & rehearsed as a child (even then I wore a white tea towel on my head) The veil is a must after all it is the one accessory that I only get to wear on your wedding day so bring it on! A veil will contribute massively to your wedding day appearance, it all started a long time ago back in history when it was believed that a veil protected the bride from evil spirits. Veils are supposed to compliment your dress and therefor should work with it and add something to your overall look. There are many lengths of veils. 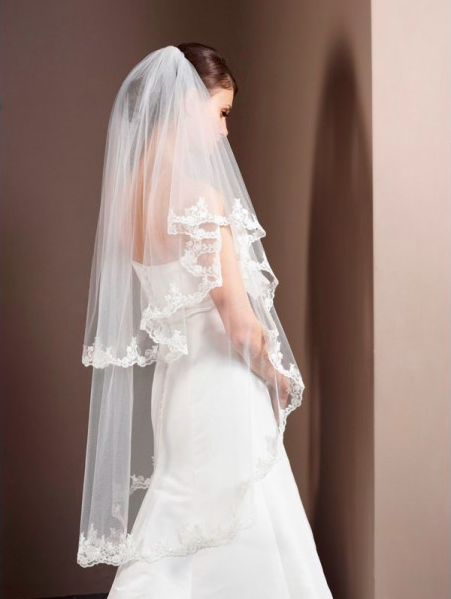 The most poular are the shorter veils but long statement veils are also still worn. 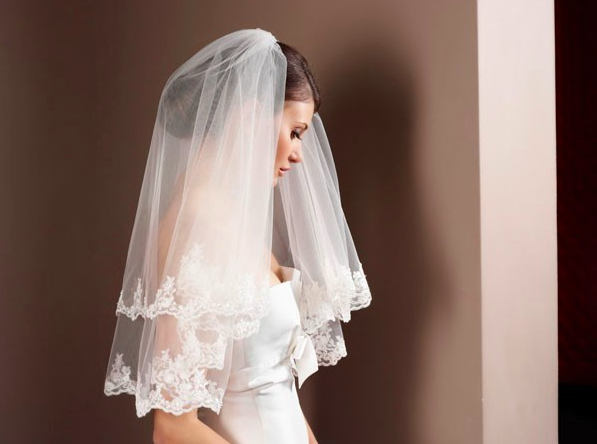 Do you know your elbow veil length from your Church veil length? Well there is no reason you would do, so here is a diagram to help show the lengths of veils ta da! 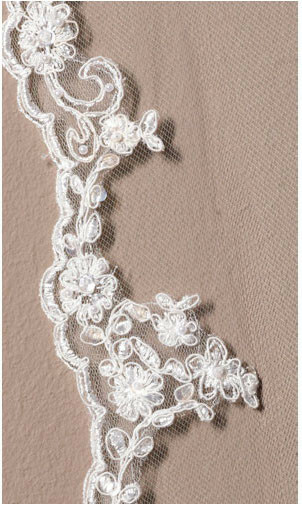 Predominantly a hairpiece this is the shortest veil length. 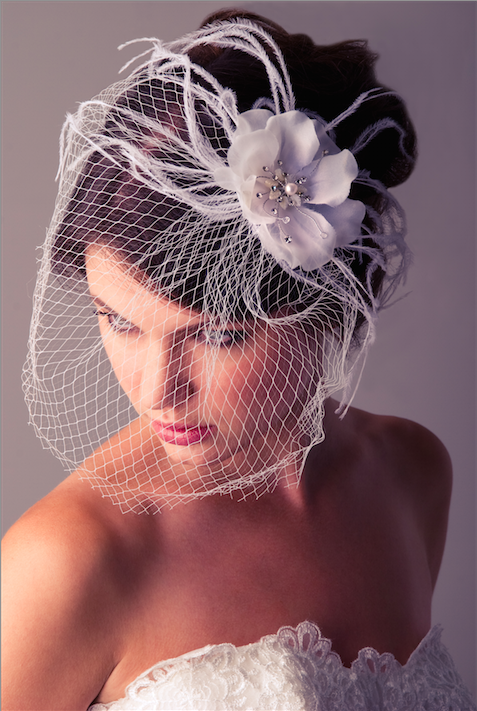 Many consider a birdcage veil as non-traditional & more of a statement hair accessory. A birdcage veil sweeps across the forehead & eyes or sometimes covers to the chin. Can also be worn over the hair only on an angle to the face. Covers the face only with nothing down the back. The length falls to approx. 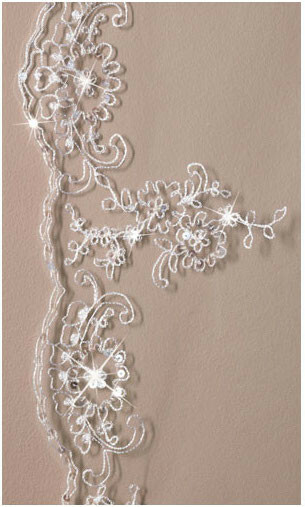 the elbow as suggested & will cover the torso section of the back of the wedding dress. This length is popular with brides but be careful as a detailed elbow length veil can cover up the back of the dress easily. 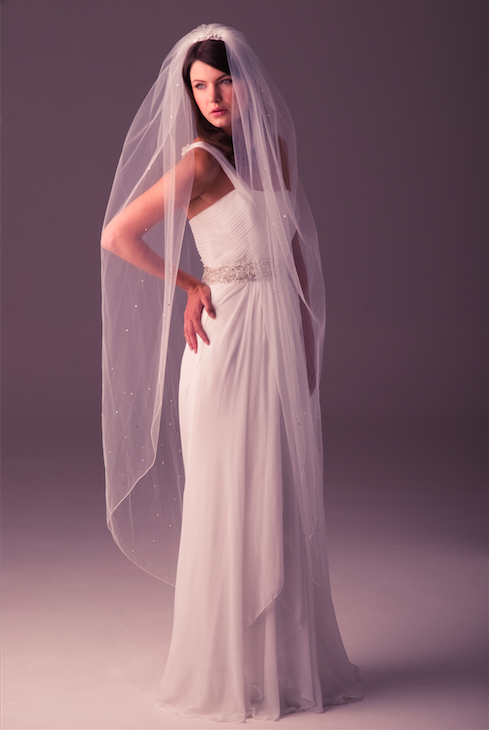 This length of veil will drop past the hips and frame the silhouette. Any back details on the dress may still be visible if you choose a simple veil. 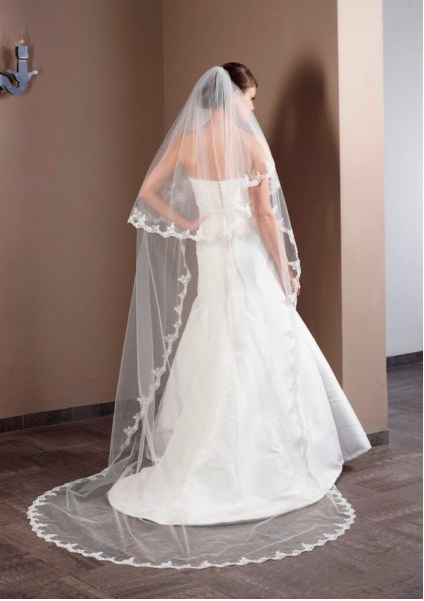 The waltz length veil should just meet the floor, Depended on your height and wedding dress train. All the below veil lengths will touch the floor & act like a train. If a long veil is what you are after then you must check how the veil will fall in line with your dress. Most veils are Ivory or white which matches the brides dress however some can come in other off white colours such as almond or champagne and you can even get black veils or bespoke colours! Remember Angelina Jolie’s veil, she married Brad Pitt earlier this year? It was covered in bright colourful children drawings. 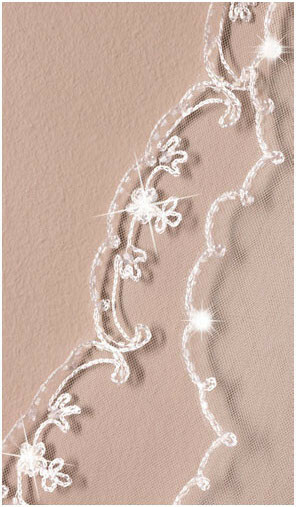 Plain edge, over locked edged, satin edge, lace trim, organza trim, beaded, crystal encrusted? You get the point right; the styles are as endless as the choice of dresses. Choose carefully as too much detail on the veil will work against a detailed dress and clash/detract or even worse still cover up the dress! 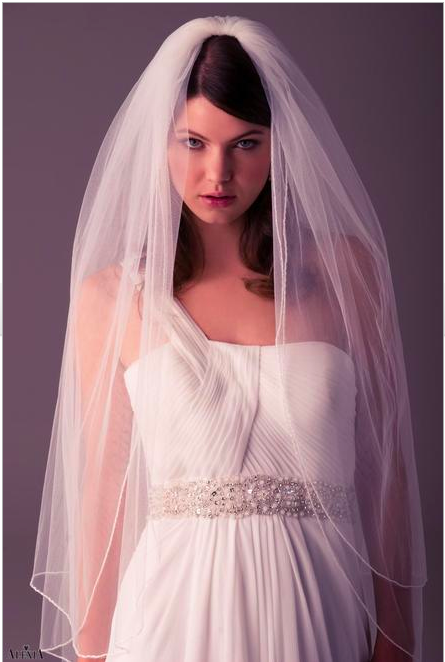 But a detailed veil will work with a simple dress. 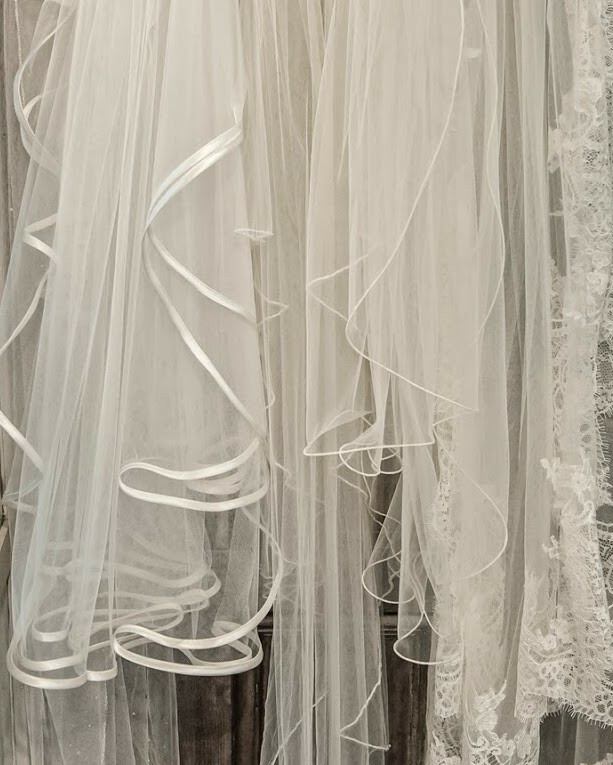 A lace veil in theory might work with a lace dress but it may end up looking like there has been a lace explosion, so don’t over do it. 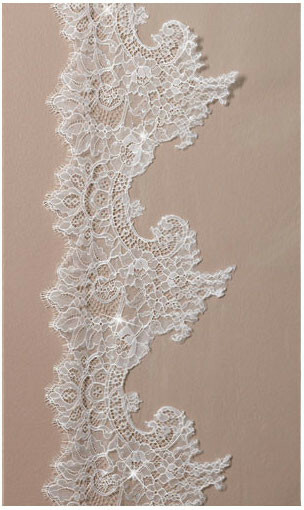 Also check out if the lace matches your dress, similarly with sparkle and beads. The placement of the details on the trim could overpower the back of your dress too so make sure you look in a mirror at the rear view. 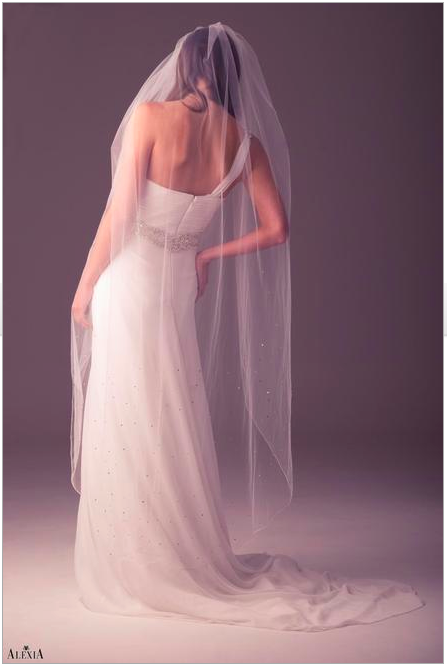 A single layer veil will hang down the back only. A double layer will have 2 tiers, one to go over the face and one to hang down the back, simple! The function of a veil is to cover the face therefor a 2 tier veil is more traditional but for many a brides a token gesture of a single tier completes the outfit and is simply worn for the ceremony & taken off after. Your veil can be attached to different points in the hairline dependent on how you choose to have your hair on the day. For hair up do’s then the veil either has to be clipped in below or above the bulk of the hair, think about if you would like your hairstyle on show. Image source Alison Jane Bridal.